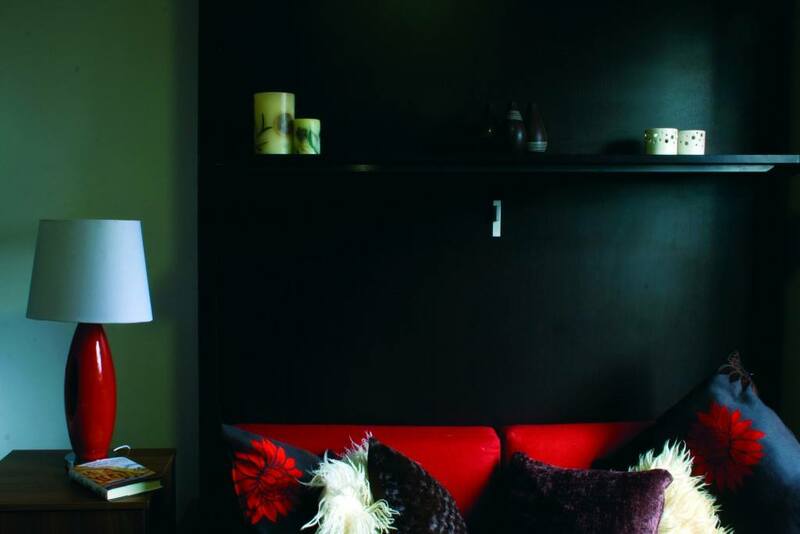 Young professionals in London need a haven, a home, somewhere to relax after a hectic day in the office but finding the perfect bolt-hole can be a daunting task. Fear not the dreaded ‘bedsit’ because Nice Group are here to help with their latest development of ‘Nice pads’. Realising there is a definite need for apartments which offer modern designer living in the heart of London without the heady price-tag one so often associates with this. Hurdwick Place is a development of 17 luxury studio apartments situated in the popular hub of North West London just a moment’s walk from Mornington Crescent tube. The project undertaken by experienced developers Nice Group has transformed a tired and worn out building into desirable studio’s; ideal crash pads for young professionals. Warm dark wood floors welcome you as you walk in. The space is compact but with intelligent use of design the apartment has a feeling of freedom, as the sunlight floods in through the original sash windows. Nice Pad’s demonstrate classic style choices and will prove practical for their occupants. 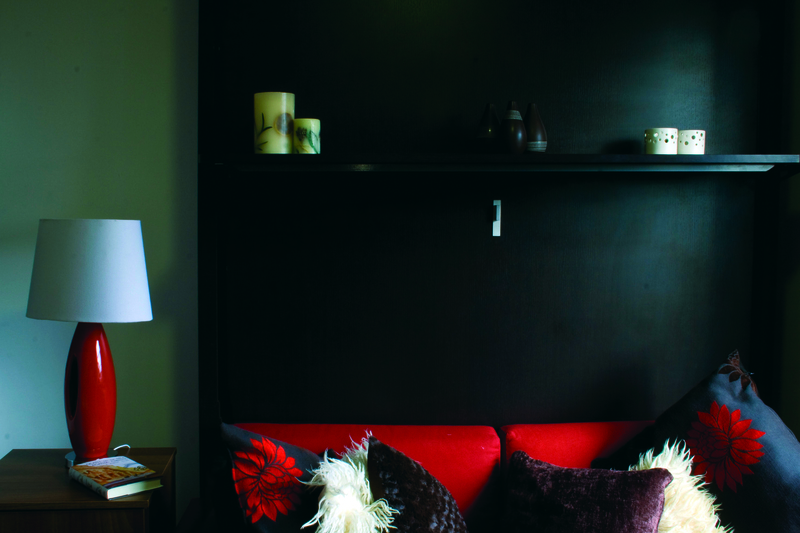 Aiming to provide their residents with a comfortable home to live in rather than just place to stay. 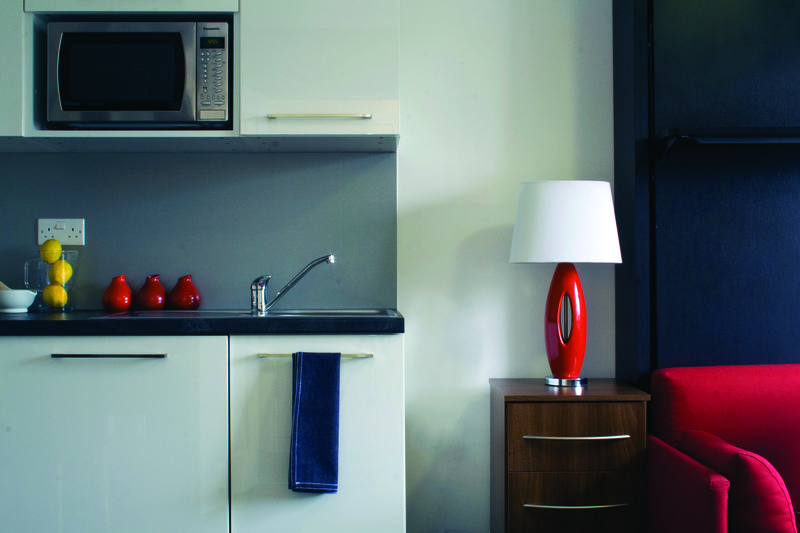 The apartments’ potential is realised by the use of functional furniture; John Strand’s British made ‘Superior ‘range of kitchens in white gloss and very clever Italian ‘Smartbeds’. John Strand Ltd has been providing compact living solutions for over 30 years so were an ideal choice to give design advice and supply the key pieces of furniture. The kitchen includes sink and drainer, integrated refrigerator, washer/dryer, combination microwave and essential in any small space, storage. The Superior range is available in a variety of finishes; white gloss was selected with a slate effect worktop for its contemporary feel and to coordinate with the colour scheme. The Dile Smartbed quite brilliantly converts from sofa into a comfortable double bed. Unlike most conventional sofa-beds the Smartbed is very simple to operate and even includes storage for bedding to make it practical for everyday use. 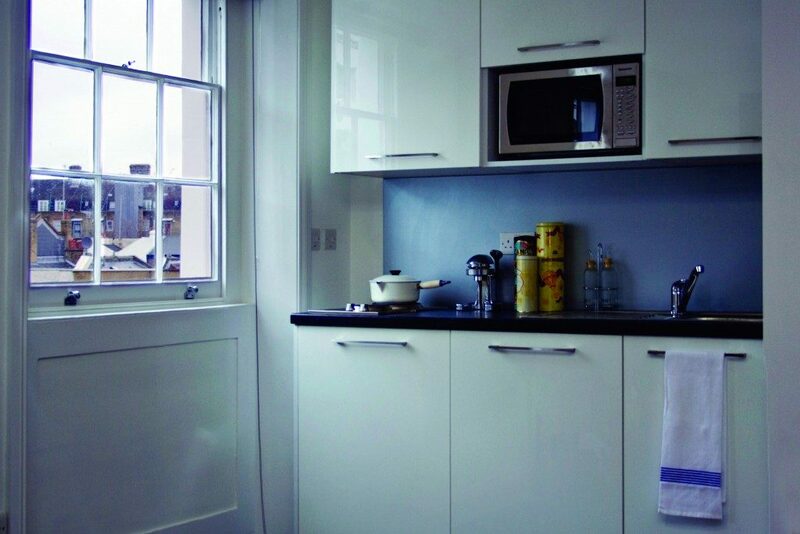 Together the use of the John Strand Smartbed and Superior kitchen has helped to accomplish the aim of the Nice Pad’s, which already have a queue of tenants waiting to move in.